Just had some warmer weather. Tried out the A/C. Air blew cold. Low speed fan was ‘low’. High speed fan was ‘high’. But the medium speed was also high. Could this be a problem with one of the relays in the large relay pack, or one of the resistors? Any suggestions appreciated. The Jaguar Delanair climate control system in fact has 4 fan speeds identified as low, med1, med2, high. 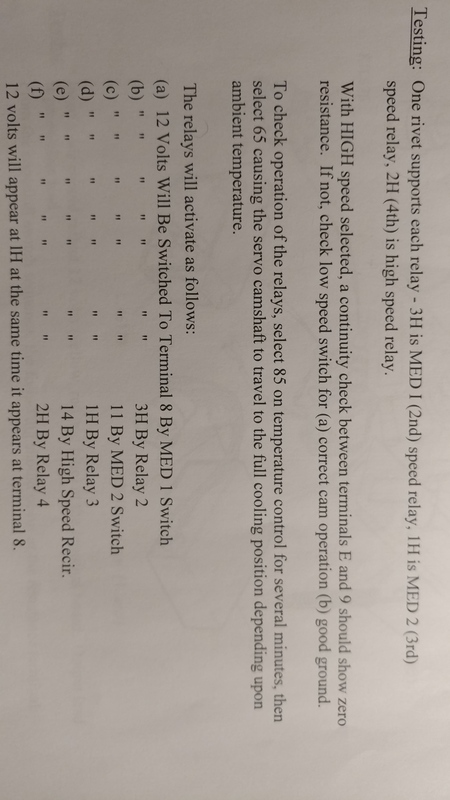 In cooling mode you have 4 speeds…in heating mode you only get 2…low and med1. Fan speeds are controlled via the servo micro switches or the override switches for low and high on the mode control selector. Low is the default position which has all elements of the resistor pack engaged. 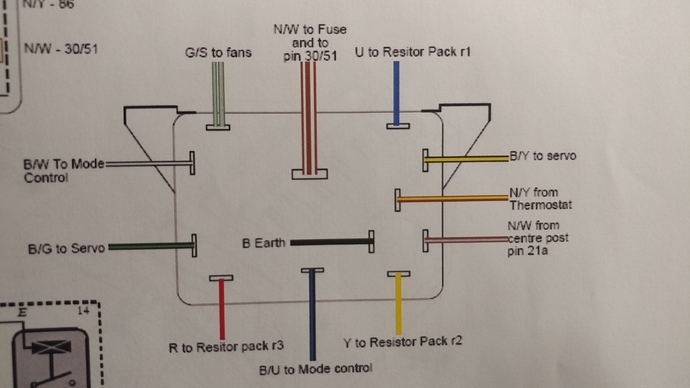 The resistor pack is made from varied lengths of ni-chrome wire attached to a insulator board and mounted into the climate control case. While not impossible, they seldom fail. So operation is by triggering the relay pack…adding or removing legs of the resistor pack. Failure could exist in one of two likely places. First, the relay coil wires are very tiny copper wires which have been know to break. You can open the relay pack and resolder those wires if broken…additionally the relay contacts could be burnt …preventing good electrical contact. The second possible cause would be a failure of one of the micro switches in the servo. Removal of the servo is required for replacement. 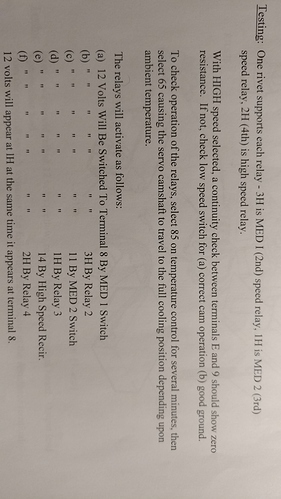 Testing of these switches should be possible by metering voltage on the corresponding connections on the relay pack. 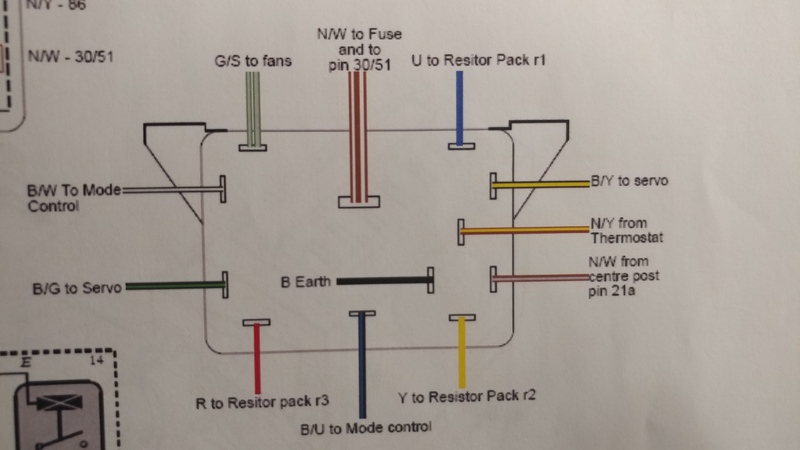 Personally i would start my testing /inspection at the relay pack, checking for voltage at the relevant fan speed connections while cycling the system between heating and cooling. That should provide enough information to identify where to focus your repair. One last thought. If the ambient temperature is below the 65 degree mark…the cooling system will likely not engage fan speed above low…and as discussed…in heating mode…you only get low and med1. So depending on ambient temperature…you may not be able to adequately test the system…you MAY NOT have any problems. As today’s high was only about 60 it may be awhile before I can perform the suggested tests. That the fans do not drop to ‘medium low’ in ‘Auto’ may just mean that set cabin temps were not reached? This can only be properly assessed by measuring air temps at the in-car temp sensor aperture. 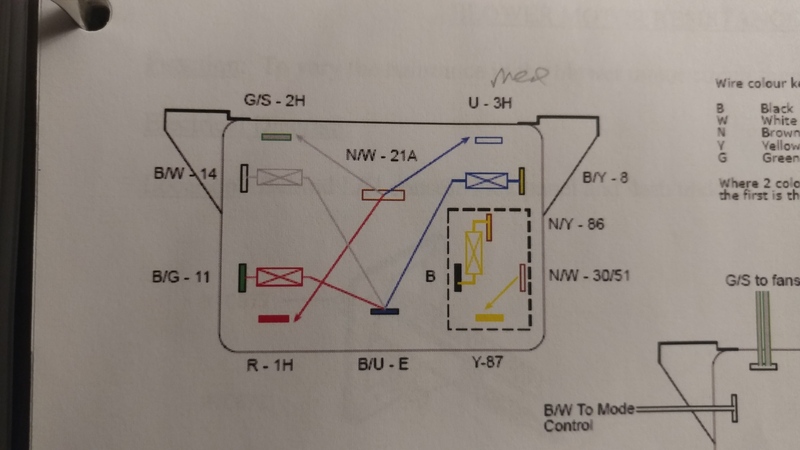 The temp control variations can also be used as a general diagnostic. Gradually altering temp selector setting with the system running; when the actual cabin temp is reached - the fan speed will drop. Another general indication is that in ‘full cold’, the centre vents are open - in ‘full heat’ they are closed. A failed relay, or a microswitch fault usually means loss of that fan speed - a failed resistor pack will leads to loss of fan speeds above the relevant resistor break. In short; you need to do testing as suggested to clarify the problem - if indeed you have one. Frank said, ‘…if indeed you have one.’ Turns out I don’t have one after all. Thank to all for suggestions. Turns out I don’t have one after all. That’s sometimes the most difficult issues to resolve, Roger. Well done!